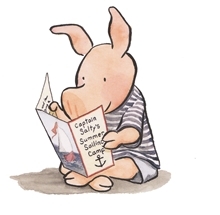 Intrepid Little Pig, from LITTLE PIG JOINS THE BAND, is back in a new adventure where once again he’s too small to join his older brothers and sisters – this time at sailing camp. Brother Tiny gives Little Pig some rope and tells him to practice tying knots, but when Grandpa and Poppy come over with a model ship his sailing fun really begins. All week they happily sail the boat in the stream until on Saturday a gust of wind carries the ship down the waterfall and Poppy can’t quite reach it. How Little Pig uses his knot-tying skills to save the day gives him his own sailing stories to share with his siblings on their return. This intergenerational tale of family and cooperation, along with the irresistible charm of Little Pig, will delight listeners of all ages.